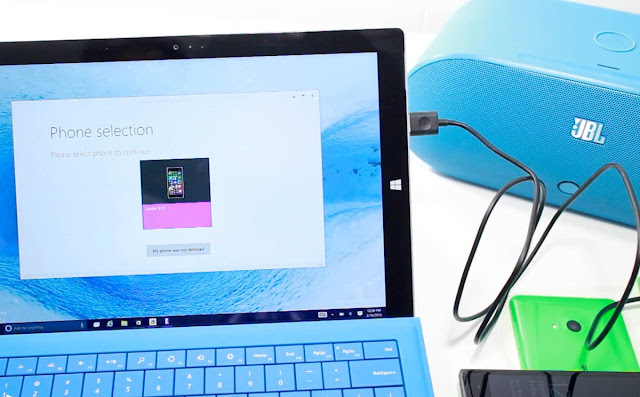 Microsoft is deep into developing the Anniversary Update for Windows 10 and Windows 10 Mobile. The Anniversary Update is known internally as Redstone 1 (Redstone 2 is due early next year) and many Insiders on PC and Mobile are already using the preview OS on their daily devices. 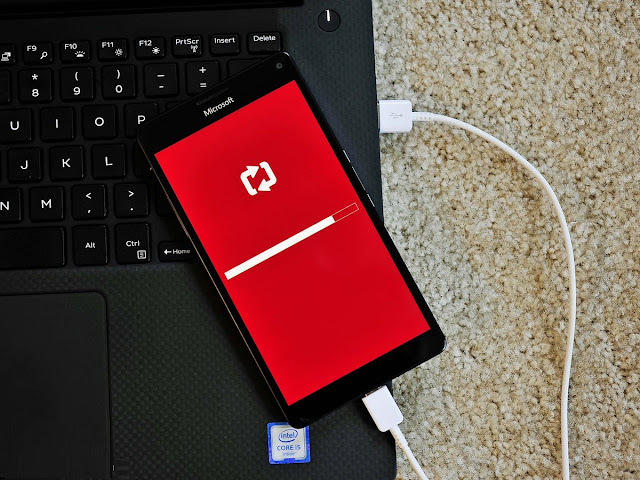 In this article, we'll walk you through on how to roll back your phone from Redstone (from Fast or Slow Ring) to the more stable production release. While not a hard process you will need some time, a USB cable and a PC. Should you use Redstone on your primary Windows Phone? At this time, it is hard to recommend Fast or Slow Ring Redstone builds (14295+) over the production build (10586.218 as of today) if you are looking for a smooth, bug-free experience. Redstone is in the early stages and is more akin to running Windows 10 Mobile last July than necessarily a mature operating system. Personally, I keep Redstone on a secondary device for testing while for my Lumia 950 I prefer Production. Windows 10 Mobile build 10586.168 and 10586.218 have been fantastic to use and if you just want the best mobile experience you should go with that. If, however, you want new features then go with Redstone. Just understand that Microsoft is refactoring the OS as the Mobile and PC versions begin to overlap heavily in features and functions. 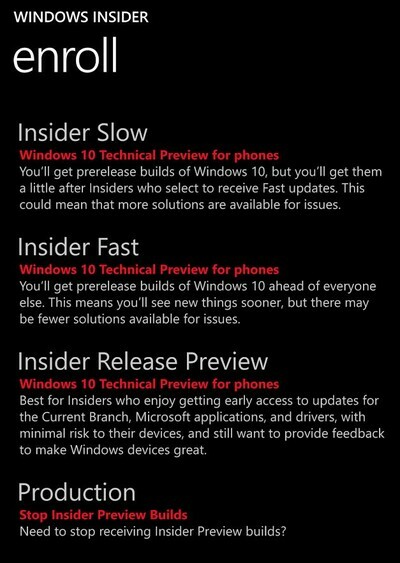 Current Insider builds will likely sharpen up closer to June at which point you may want to consider jumping back into the mix. Let's say you are on Windows 10 Mobile build 14295 (or later) and want to go back to Production (10586) – How do you do it? Can you just switch Insider Rings? If you launch the Windows Insider app on your phone and choose a different Ring e.g. Production instead of Fast or Slow, you will stop getting Insider builds. However, this will not revert your OS to an earlier version. 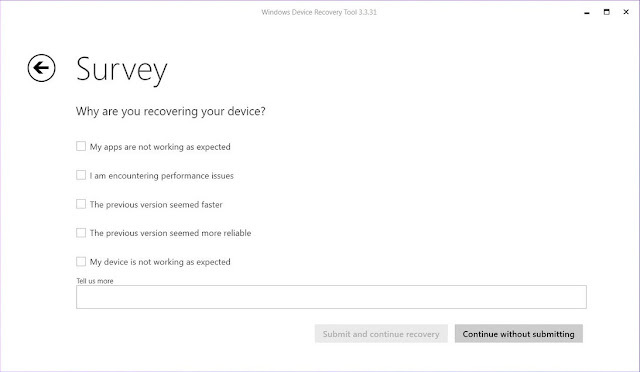 Currently, if you are a higher build of the OS the only way to go back is to use the Windows Device Recovery Tool (WDRT). Before we begin let's be very clear: this process will erase your phone and install the old OS (and maybe some firmware if not yet distributed over-the-air). You will lose all data on the phone (SD cards are untouched). 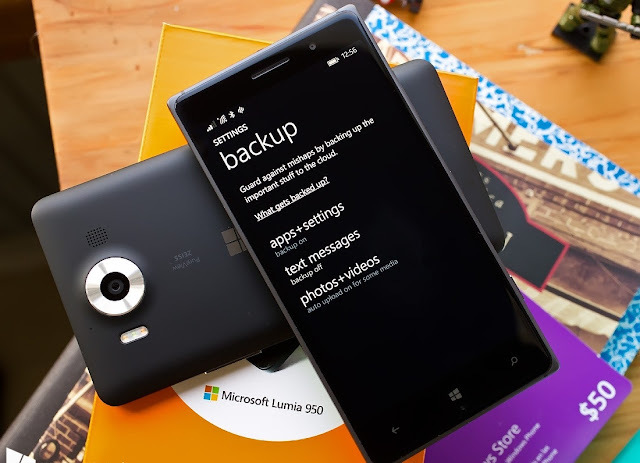 Remember to copy any files to your PC or storage card on the phone (if supported) and to use Windows Phone Backup (Settings > Update & security > Backup > More options > Back up now). 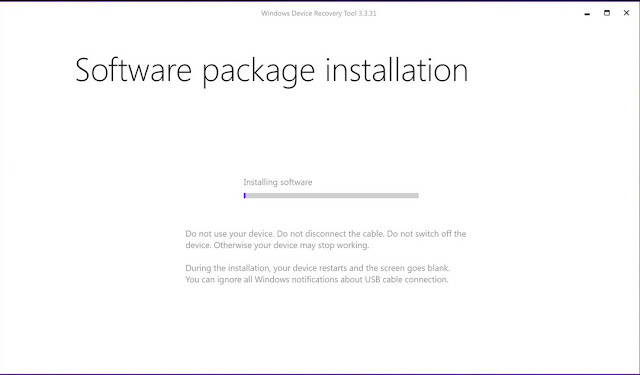 Once you have downloaded and installed Windows Device Recovery Tool, you are all set to start the rollback process. You should allocate around 30 minutes for the restore process. My phone was not detected to force the application to rescan for and detect the phone or choose from the list of manufacturers e.g. BLU. On the next screen, click your phone, wait a few seconds, and you'll see your phone information and the software available for download to roll back to a previous operating system. To continue, click Reinstall software. Next, the recovery tool will warn you to backup all your data, settings, and apps before proceeding further, as the rolling back process will delete all the previous data on your phone. Click Continue to move forward. 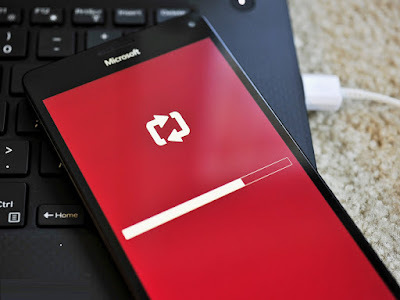 Now, the recovery tool will download the image from Microsoft's servers and replace Windows 10 Mobile that is currently on your phone. The process will take some time depending on your internet connection and the hardware in question. 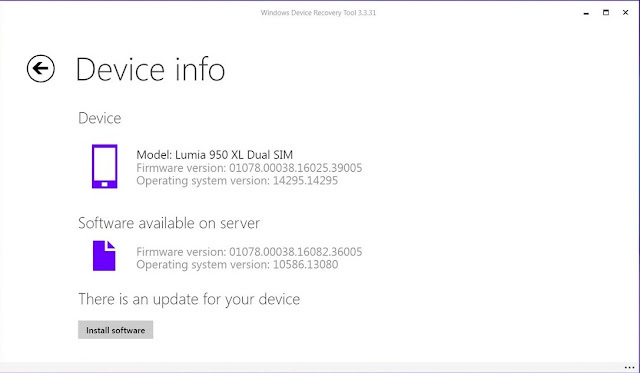 Note: Phones sold with Windows Phone 8.1 who upgraded to Windows 10 Mobile will revert to Windows Phone 8.1. They will then need to upgrade to Windows 10 Mobile again. 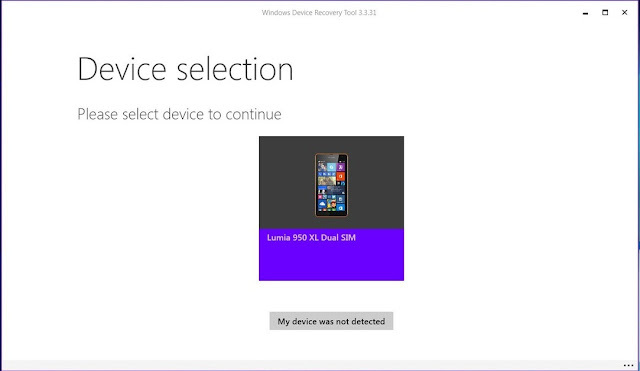 Phones sold with Windows 10 Mobile pre-installed e.g. Lumia 550, 650, 950, 950 XL and other phones like Moly X1 will go back to the production release of Windows 10 Mobile. 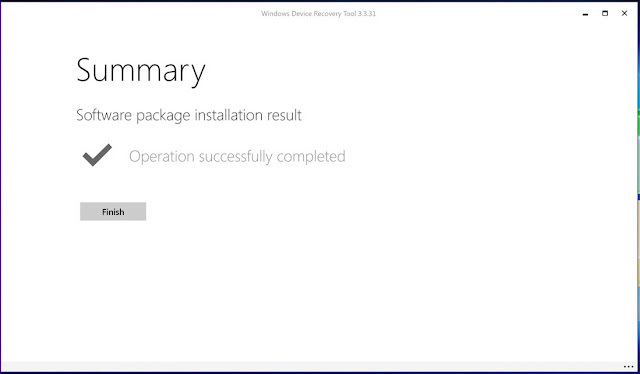 After the tool completes the process, you will receive a message saying "Operation successfully completed." At this point, the phone will reboot, and you will have to go through the Out-of-Box-Experience (OOBE), like on any version of Windows. 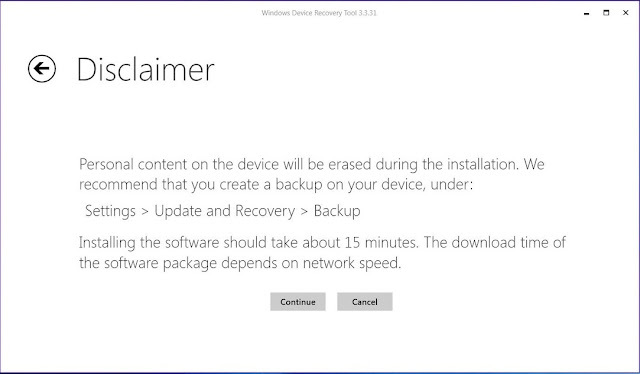 Then, you'll need to sign-in with your Microsoft account, select to restore your phone from backup (if this is something you prefer), and after a few additional questions, you'll be back to an earlier version of Windows. If you check for updates and there is nothing new then you are on the latest release. One interesting question we get a lot is should you restore from a backup during the Out-of-Box-Experience (OOBE)? Yes, it should be fine as that is what it is designed to do. Remember, however, that you are now adding an extra layer of complexity to the situation meaning another area where things may not go right. There is no risk of damaging your device, but some users have claimed that doing a clean install and just manually rebuilding your phone and software is a better choice. Personally, I'm agnostic on this issue, but I do not restore from backup as the majority of my things are on the SD card (e.g. music, photos, documents) or in the cloud (OneDrive). I also like starting fresh as I tend to reconsider app choices, layout, etc. However, if you have game saves etc. that you need you may want to think out your options. I should mention that restoring also takes much longer as your phone will then re-download all your apps and games and install them while merging saved data. If you have 100+ apps and games on your phone, this could take some considerable time depending on your internet connection so set aside a good 30-60 minutes (once again, it will vary on the number of apps and phone's processor) along with an AC plug for your phone to keep it charged.